I love living close to grocery stores. Less than a 5 minute walk. I feel like it’s a small European thing being able to just go get what you want without fussing with driving. Even so, it’s nice to have enough flexible ingredients in your pantry, and maybe some leftovers. Then it just makes it so easy to whip something up. A quick nom. Sandra Lee -ish, half store bought, half homemade. I made pulled chicken for this week’s go to leftovers. Real easy to make, just season some chicken with whatever, pan fry, and braise with some liquid on low heat for about 40 minutes. I used crushed tomatoes because I had half a can leftover in the fridge. Then pulled the chicken with a fork. 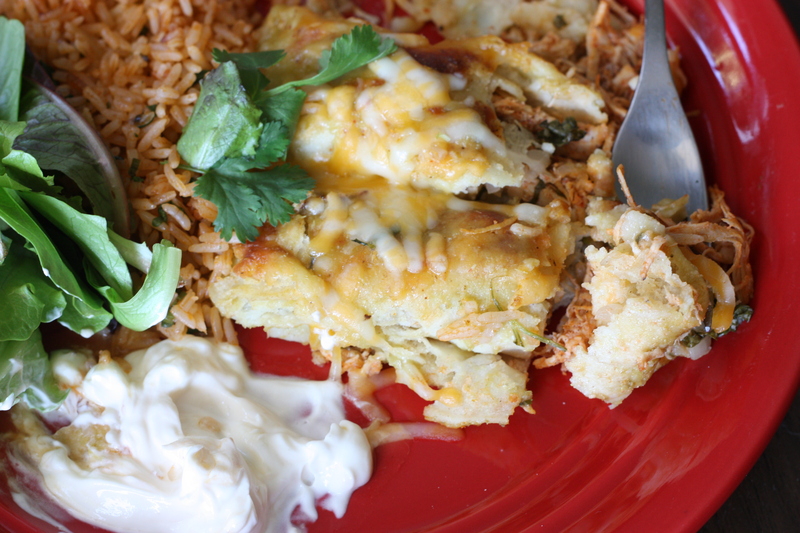 With all this chicken, we wanted some enchiladas, which is so easy to do. I just rolled the chicken in corn tortillas along with some onions, cilantro, and a little cumin powder. 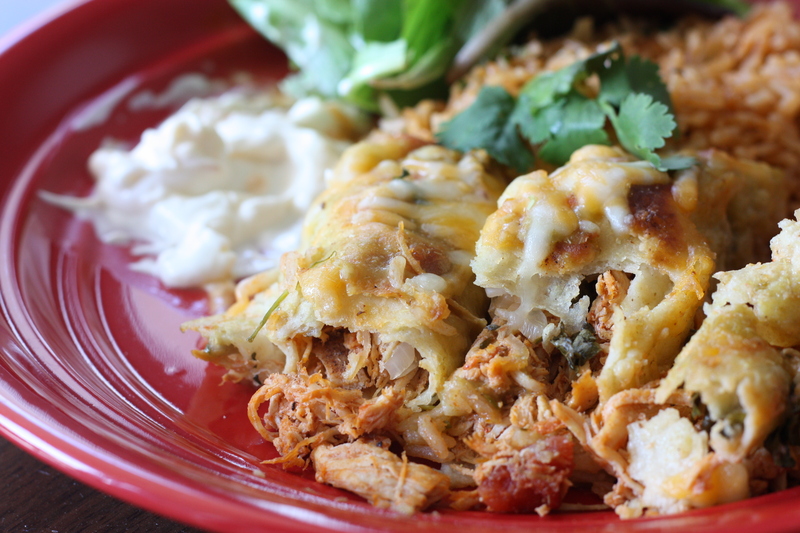 Layer the rolls side by side in a baking pan, and smother with enchiladas sauce (from the can) and top with cheese. Cover with foil and bake at 375 F. Then after 15 minutes, uncover and broil the top so that you get some browning. Make this however you want! Serve with Spanish Rice. Real simple. Just cook rice on the stove top with tomatoes, onions, and a clove of garlic and some oregano. I garnished with a generous amount of green onions and cilantro after fluffing the rice. Good choice after a busy day of work. This entry was posted on March 12, 2012 by rrfoods in Lunch, Quick Nom and tagged chicken, enchiladas, Mexican.